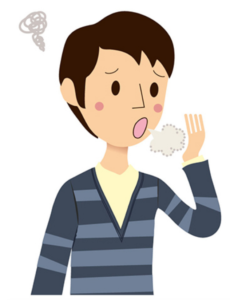 Bad breath, or halitosis, is an embarrassing but common problem. It affects most of us at some time or another. Selecting the best toothpaste for bad breath is a crucial step towards dealing with the problem. To help you do this we have reviewed a selection of the best toothpastes for bad breath on the market today. There are hundreds of different toothpastes and they’ve all been engineered to address different problems. Finding one that tackles bad breath and suits all your other oral health needs can be bewildering. So we’ve done the hard work for you. Before we get started though, it’s important to understand the different causes of bad breath. This will enable you to deal with the issue in the most effective way. The main cause of bad breath is a build up of oral bacteria. Much of what we eat or drink remains in our mouths in hard to reach places. In that warm damp environment it decays and causes bacteria to multiply. Eventually the bacteria forms a sticky film called plaque that coats your teeth, gums and tongue. As bacteria reproduce and metabolise food debris they give off a nasty smell. The only way to eliminate this is to eliminate the bacteria. Choosing a good toothpaste is the first – but only the first – step to doing this. Following our reviews we provide advice on other steps you should follow to end bad breath once and for all. Because it’s vital to have a good oral health regime based on more than just the right toothpaste. Smoking – Smoking causes dry mouth (xerostomia) so there is less saliva to wash bacteria away. Drink plenty of water and use a toothpaste formulated to deal with xerostomia like Therabreath (reviewed below). Certain medications/Pungent foods like garlic – For both these causes use a mouthwash between brushing and keep a supply of sugar free mints handy (preferably containing xylitol – a sweetner that most bacteria cannot process). Low carb diets – Low carb diets cause the body to burn fat and sugar stores for energy. This in turn releases ketones that can cause bad breath. If you’re on one of these diets you will need a supply of sugar free mints or chewing gum to mask the odour. What should you look for in a toothpaste to deal with Bad Breath? Anti plaque ingredients which help to eliminate and prevent plaque build up. These include zinc citrate and stannous fluoride. Triclosan is also used but there are (disputed) concerns surrounding the use of this chemical. Antibacterial ingredients like sodium chlorite, zinc, eucalyptus oil and triclosan help to reduce the bacterial load in your mouth. Deodorizing ingredients such as sodium bicarbonate or calcium bicarbonate may also be included. You may also wish to check for the American Dental Association (ADA) Seal of Acceptance which shows the product has been tested for safety and efficacy. However, the ADA will not approve products without fluoride. Remember, real long lasting breath freshness can only occur when the bacteria causing bad breath is brought under control. For this to happen you need to do more than just brush your teeth. At the end of our reviews you will find advice on other steps you can take to eliminate bad breath once and for all. Suitable for use with crowns and other dental work. CloSYS deploys a formula called cloralstan (based on chlorine dioxide) which kills 99% of the oral bacteria that cause bad breath. It is also Ph balanced which makes the mouth less prone to germ growth. CloSYS can be used to tackle bad breath while also allowing you to continue with your tooth whitening regime. This is because it contains gentle polishing agents to remove staining. At the same time tooth enamel is protected and strengthened through the use of sodium fluoride and sodium phosphates which also prevent cavities. An additional benefit of CloSYS is that it does not contain sulphates. These are commonly used as foaming agents but some people are sensitive to sulphates and their use is linked to canker sores. CloSYS is ADA approved and is one of the leaders when it comes to fighting bad breath. Its mild formulation makes it a great choice for anyone with sensitive teeth who wants to maintain a dazzling smile. For extra protection, combine the toothpaste with ADA approved CloSYS mouthwash. Philips BreathRX contains a blend of zinc, thymol and eucalyptus oil. Each of these ingredients has strong antibacterial properties. Combined with cetylpyridinium chloride and tetrapotassium pyrophosphate, BreathRX breaks down the bacteria that cause bad odours as well as preventing plaque and tartar buildup. It also contains fluoride to prevent cavities and strengthen tooth enamel. BreathRX allows you to tackle the problem of bad breath whilst still following a teeth whitening regime. Silica is used to gently buff away stains and titanium dioxide brightens teeth. So it’s a great choice not only for fresh breath, but a brighter smile. It has a clean, long lasting fresh minty flavour and a pleasing gel consistency. BreathRX contains sodium lauryl sulphate (SLS) so if you have concerns about the inclusion of SLS (which can be an irritant), this may not be the toothpaste for you. However, BreathRX is highly rated on Amazon and is available as part of a 3 step range to eliminate bad breath once and for all. If you have a Philips Sonicare toothbrush, you can brush with BreathRX, Scrape with a Sonicare Tongue Cleaner and rinse with BreathRX mouthwash. Uses a patented formula (Oxygene) and zinc to neutralise odours. Clinically proven to be better than leading brands at reducing plaque and improving oral health. Oxyfresh uses a patented formula called Oxygene. Combined with zinc, Oxygene prevents bacterial build up, detoxifies the mouth and completely neutralises (rather than just masking) bad odours. In a 12 month study it was found to reduce oral bacteria by 85% and be far more effective at reducing plaque build up and gum disease than other leading brands. It contains xylitol which is a natural sweetener that cannot be processed by most bacteria so this also helps to control the bacterial load in your mouth. It’s also ph balanced which makes the mouth less prone to germ growth. In addition, it is loaded with essential oils which give it an intriguing lemony flavour and has a pleasing non gritty, gel like consistency. Oxyfresh Fresh Breath is also gentle on teeth with a low abrasivity which means your tooth enamel is well protected. Oxyfresh Fresh Breath is more expensive than regular toothpastes, but it does deal effectively with the problem of fresh breath. It’s also highly concentrated and lasts up to four times longer than other products so it is not as costly as it first appears. It is highly regarded and rated by users who enjoy the long lasting clean, fresh feel they achieve from using it and can be used in combination with Oxyfresh mouthwash. One slight fly in the ointment is that Oxyfresh contains carrageenan. Carrageenan is a seaweed based product used for thickening purposes. It is approved for use by the US Food and Drug Administration but has been linked with stomach irritation. Free of artificial colours, flavours and sweetners. Therabreath was originally created over 20 years ago by a dentist whose daughter was being bullied due to bad breath. So you can be sure it’s been made with a loving determination to conquer halitosis and restore confidence! It contains xylitol which helps reduce the bacterial load in the mouth and pyrophosphates and citric acid which prevent plaque and tartar build up. Sodium Chlorite is used as an anti bacterial agent. Since it is SLS free it is gentle on the gums and it contains aloe vera to both soothe the mouth and keep it moist. This makes it a great toothpaste if you are a smoker or suffer from the dry mouth which is associated with bad breath. Therabreath has a very mild mint flavour which does not ‘burn’. It doesn’t foam (as it is SLS free) and has a thinner consistency than some toothpastes which takes some getting used to. Users who suffer from dry mouth and canker sores really love the product and claim it is value for money. Therabreath can be used in conjunction with Therabreath mouthwash or dry mouth mouthwash and lozenges. Uses all natural ingredients such as baking soda, sea salts, and mint essential oils to deodorise and cleanse the mouth. Is SLS, fluoride, gluten and cruelty free. Available in fennel, wintergreen and ginger flavours. Formulated with baking soda and mint essential oils, this toothpaste from Desert Essence is a fabulous all natural toothpaste for bad breath. Both tea tree oil and sea salt have long been acknowledged to have healing and antiseptic properties. These ingredients combine to work hard to keep harmful bacteria at bay, but that’s not all. Baking soda both whitens teeth and absorbs bad odours, whilst sea salt encourages the production of saliva. This has the dual benefit of increasing the cleaning power of other ingredients and preventing dry mouth (a key cause of bad breath). Desert Essence Tea Tree toothpaste is a thoughtfully formulated product which is all natural and extremely effective at combating bad breath whilst looking after all your other oral needs. The absence of SLS and the presence of tea tree oil make the product great for anyone prone to sore or bleeding gums. Desert Essence flavours are quite mild and the paste itself is very similar in texture to regular toothpaste and is adored by its users. Deploys activated coconut charcoal powder to remove stains, whiten teeth and absorb the gas molecules that cause bad breath. Uses Transatak – a Japanese blend of herbs and essential oils that prevents bad breath. Might discolour your sink if not fully rinsed out after use. Activated charcoal is a fantastic detoxifying agent and Twin Lotus deploys charcoal from coconut trees which is extremely absorbent. This means it both attracts and remove stains, giving you a whiter smile whilst soaking up the gas molecules that cause bad breath. The special blend of herbs and essential oils includes guava and clove oil. Both of these have strong antibacterial properties and clove oil has been used for centuries to treat toothache and gum infection. Sodium lauroyl sarcosinate is used as a foaming agent, but though it has the same initials as SLS, it not the same thing. Sodium lauroyl sarcosinate is extremely mild and has no irritating effects. Twin Lotus does not have a strong burning flavour like many conventional toothpastes but the long lasting fresh breath feel it generates is commented on favourably by users. Its black rather gritty texture does take some getting used to and the product may stain your toothbrush and sink if they are not carefully rinsed after use. Each of our carefully selected specialist toothpastes caters for a range of other oral health needs. These include dry mouth, the need to continue with a teeth whitening regime, the desire for an ADA approved fluoride product, the need for a non fluoride product, the need for a purely natural product, etc. But choosing the right toothpaste is only the beginning of a regime that knocks bad breath on the head, once and for all. It’s important to brush correctly. At least twice a day for at least two minutes. Use an electric toothbrush! The choice is bewildering but at the very least consider an Oral B pro 1000 which removes 300% more plaque than a manual toothbrush. FLOSS! Flossing has so many benefits. No matter how good your toothpaste, toothbrush and brushing technique – food debris will lurk in impossible to reach places. Since your mouth is warm and damp food debris will decay and bacteria will multiply exponentially. This will not only lead to bad breath, but potentially to gum disease or even bacteria entering your bloodstream and damaging your overall systemic health. Only flossing will deal with this problem. If you hate flossing, then invest in a water flosser. It’s fun, fast and super effective. Don’t forget your tongue! Bacteria love your tongue. It’s fuzzy and warm and damp and a great place for bacteria to be. Invest in a tongue scraper. Use a specially formulated mouthwash. Most of the brands above provide mouthwashes that eliminate and prevent bad breath. Visit your dentist at least twice a year for a deep clean and advice on how to make your mouth, which is after all an important gateway to your body, in tip top condition.